Greasewood Gallery at the Hotel Paisano exhibits thoughtfully curated shows featuring the work of local artists. From sculpture to oil and watercolor paintings, photography and more, the Greasewood Gallery is an anchor for the works and themes produced by living in the unparalleled beauty of the Big Bend region, and is a wonderful primer to the people who call this place home. 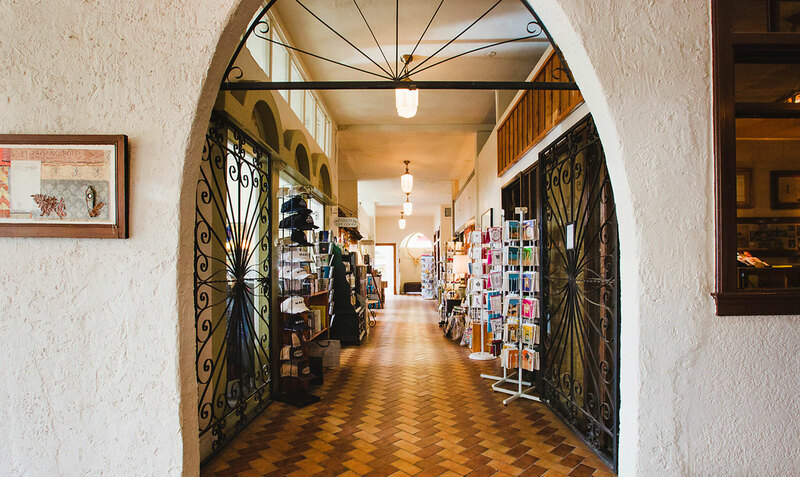 Greasewood Gallery also incorporates the hotel’s grand ballroom as a seasonal exhibit space and often features artist’s work in the spaciously tiled lobby. Artist’s receptions are hosted with each new exhibit and are open to the public. The Hotel Paisano Gift Shop offers several rooms filled with a superb selection of designer and casual clothing, jewelry and accessories; an exceptional array of toys, books, journals and art supplies; home décor and gift items; and locally made art and jewelry. Items of local interest including books, postcards and videos; casual wear and souvenir items emblazoned with MARFA or the Hotel Paisano logo; quality skin care and fragrance lines as well as travel-sized toiletries; beverages, snacks and much, much more available for the hotel’s valued guests. The Hotel Paisano’s GIANT memorabilia room offers gift and souvenir items related to the movie and cast. Items such as James Dean t-shirts, Elizabeth Taylor note cards, copies of the novel by Edna Ferber and the Warner Brothers anniversary edition DVD, and recreations of the original key tags with the actors’ name and room number are all available for purchase. Shipping is available on most items. Hours of operation are Monday through Saturday: 8 a.m. to 8 p.m., Sunday: 8 a.m. to 6 p.m. Holiday hours may vary.